Google is fun to say, but DuckDuckGo — at least for me — is a lot more fun to use. While I can’t repeat the name as a verb (I can ‘Google it’ on Google; I don’t know what I’d say for a DuckDuckGo search), the upstart search engine has quickly become my go-to on a day to day basis. So, why is DuckDuckGo better than Google? While its main draw is privacy, DuckDuckGo has another killer feature you may not have heard of. In fact, it should cause you to consider ditching your existing search engine for DuckDuckGo — yes, even Google. I’m talking about bangs. No, not 80s hair bangs (but they would look cool on their mascot, Dax). Bangs are simply exclamation points ahead of site tags, which redirects you to that page. 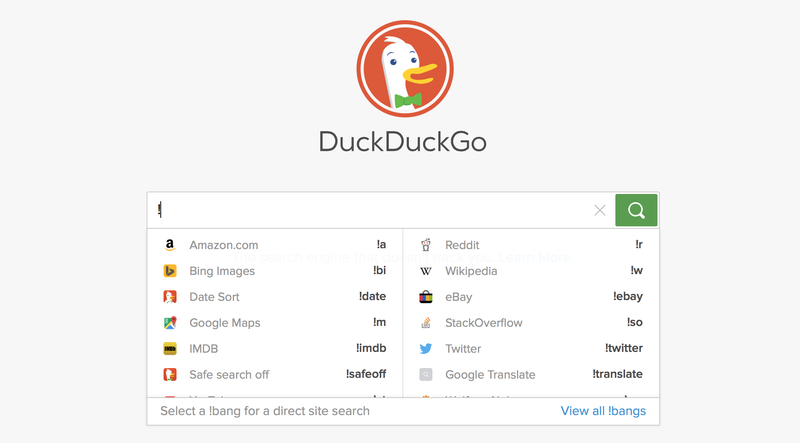 Here’s how to use DuckDuckGo Bangs: you want to search The Next Web for articles on DuckDuckGo. To get the best results, you’d head to the site’s home page, find your way to the search function (top right! ), and type your query. With DuckDuckGo, you simply enter “!tnw DuckDuckGo” (not case sensitive, and you don’t need parentheses), and it would redirect you right to the internal search page. The same goes for tons of other sites like Amazon Wikipedia YouTube — and yes, even Google. That’s the brilliance of bangs; you can search just about anywhere from DuckDuckGo. It only gets easier when you add the extension for Safari or Chrome, too. And because there are more searchable sites on the Internet than you can likely keep track of, DuckDuckGo recently made a change to its search bar. Now when you enter a bang, a list of popular bangs shows up, and you’ll have quick access to the full list. Other search engines will let you perform a concentrated search using the “site:” tag (“site: the next web duckduckgo”, for instance), but it opens up in the search engine. Bangs take you directly to the site you want to find results on. DuckDuckGo also hits really close to home for all of us by not tracking search history. Here’s a scenario; you search for something benign, like ‘cars.’ When you click on a website, your current search engine may tell the site that you searched for cars and landed on its page. That can be useful for a variety of reasons, but it’s typically a monetization strategy. Sites know where you visit after you search for ‘cars’ and return ads concentrated to your likes. DuckDuckGo uses the same kind of model, but doesn’t return personalized ads. If you search for ‘cars’ in Google and clicked on the Scion page, you may see ads specific to Scion next time you did a search for ‘cars.’ DuckDuckGo has ads, but in its eyes — cars means cars. The site uses a syndication model that keeps your info private, but still allows for it to monetize. The downside to DuckDuckGo is that’s it’s not quite as intuitive as Google when it comes to news; search Google for a topic and it feeds you newsworthy articles on your query. That’s easily circumvented with a “!g” though, which takes you straight to Google search results. While DuckDuckGo is definitely one of the more private search engines around, bangs really have me loving it. I think once you give DuckDuckGo a shot (if you’re not already), you’ll enjoy them, too.